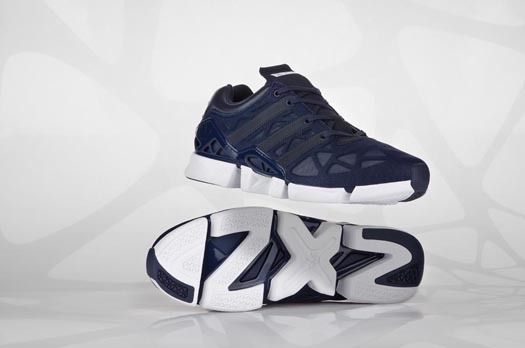 NEW YORK, Dec 15, 2011/ FW/ — Already available online at www.shopadidas.com and expected to be in the store shelves of Foot Locker, Champs as well as adidas Originals stores on December 26th, the H3LIUM ZXZ Runner is currently the lightest shoe to date from adidas Originals. Elements from historical and current adidas footwear were used to develop H3LIUM. The sole of the shoe pays homage to the ZX8000, an adidas running shoe known for its comfort and techniques from F50 cleat were used to simplify the shoe’s structure, making it lighter while still maintaining its structural integrity. As a result H3LIUM is lightweight, breathable and made with a simple construction that provides comfort and support. The footwear was inspired by seam sealed wind-wear and tech fabrics, designed to be worn in varying climates and environmental conditions. Taking on an architectural influence, the triangle pattern design used on the shoe adds structure. The Fall/Winter 2011 H3LIUM collection retails for $110.